Natural herbal extract cleans the ears without drying or burning. 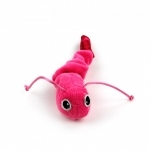 Soothes and comforts ears that itch, are red, and visibly annoy pet. A gentle ear cleaning lotion formulated by an herbal scientist using only premium botanicals. The inside of your dog’s ear is warm and moist. It’s a perfect breeding ground for bacteria. Ears All Right™ is a natural botanical formula that works to break down and remove wax, dirt, and foreign debris. Helps heal and prevent infection from minor scratches and insect bites. Relieves issues associated with yeast infections, excessive wax build up, ear odor, and allergies. Made in the USA. Remember...healthy pet ears have no smell! "Senior Friendly” bite size soft chews with excellent taste and a healthful purpose! Old Dogs! Happy Joints! is helpful for senior dog mobility, flexibility and discomfort associated with aging. Each soft chew contains glucosamine, turmeric, New Zealand green-lipped mussel, chondroitin, and egg albumin. Each bag contains 90 soft chews. Made in the USA. “Senior Friendly” bite size soft chews with excellent taste and a healthful purpose! Helpful for canine heart health associated with aging. Helps support healthy, normal heart function, healthy heart muscle, heart rhythm, blood pressure and circulation. Each bag contains 60 Chews. “Senior Friendly” bite size soft chews with excellent taste and a healthful purpose! 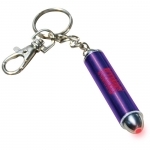 Helps support cognitive issues associated with aging, disorientation, recognition, memory, and learned behavior. Each soft chew contains fish oil (omega-3), acetyl-L-carnitine, resveratrol, L-theanine, phosphatidylserine, pyridoxine hydrochloride, ginkgo biloba. 90 soft chews in every bag. Made in the USA. Joint Rescue contains glucosamine, herbs, and botanicals that provide comfort to pets with mobility issues morning stiffness, and age related mobility issues. Ark Naturals combination of glucosamine, chondroitin, herbs, and antioxidants make this joint product the best in its class. A natural way to "rescue" your pet from the difficulties some dogs and cats experience due to long walks, jumping on couches, hiking, running, as well as age related immobility. Glucosamine + Ark's blend of comfort producing herbs can help your dog feel better and enjoy being active. Made in the USA. Ark’s Neem “Protect” Spray is an environmentally friendly, gentle, and non-drying formula for pets including dogs, cats, and horses. It is used for animals with skin and coat issues including insect bites and skin and coat irritation. This botanical formula was developed as a natural, botanical alternative to chemical pesticides in controlling fleas and ticks on your pet. It is easy to apply and leaves a mild, fresh smell. You simply spray on a light application, massage into pet's coat, and it starts to work immediately to repel and kill fleas, ticks, and mosquitoes. Gentle eye wash formulated to soothe and maintain healthy eyes. Eyes so Bright™ is great for removing foreign debris and encrustation that build up in the mucous membranes of your pet's eyes. Active ingredients include aloe, goldenseal, and echinacea. Made in the USA. 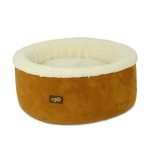 Let your cat (or small dog) experience the ultimate in kitty comfort with this super soft high plush top bed with contrasting honeycomb rings of earth friendly hemp outer. 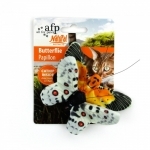 Super soft polyfill gives your cat supportive comfort, and ensures the bed hold it shape. Your cat will jump at the chance to get her paws on this Tinkly Twins. It is filled with catnip and features tinkly bell on the tail that's sure to keep your feline occupied. These are shipped in assorted colors. Your cat will jump at the chance to get its paws on this Tea Party. 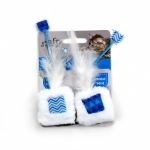 It is filled with catnip and features a feathered tail that's sure to keep your feline occupied. 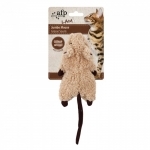 Cats are naturally drawn to the crinkle sound and premium catnip of this Sweet Tooth Mouse. 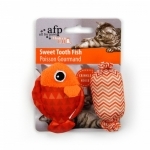 Cats are naturally drawn to the crinkle sound and premium catnip of this Sweet Tooth Fish. Cats are naturally drawn to the crinkle sound and premium catnip of these Surf Snakes. Cats are naturally drawn to the crinkle sound and premium catnip of this Speedy Snake. 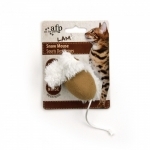 This catnip infused Snow Mouse makes noise as it is batted around encouraging longer play. 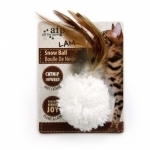 This catnip infused Snow ball makes bird noises as it is batted around encouraging longer play. Cats are naturally drawn to the crinkle sound and premium catnip of this sleepy mouse. 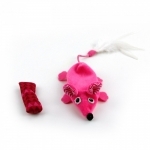 You will see the natural hunting instinct take over as your cat tackles, bats and chases the uniquely designed sleepy mouse. 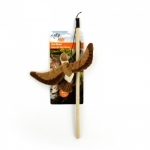 These bird wands will stimulate your cat's natural instinct to stalk and swat. Each toy features catnip inside for added appeal. 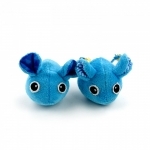 This catnip infused Jumbo Mouse makes noise as it is batted around encouraging longer play. Filled entirely with 100% Canadian imported Catnip. 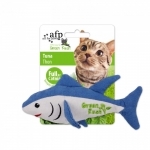 Entice your cat to pounce, ravage and chase. They are up for the chase and ready to entertain. Grab your frisky feline one today!